If you’re still trying to figure out how to do it all—to be great mom, a great wife, and a great employee—and you’re starting to realize that it just isn’t possible, it may be time to drop a ball or two. Tiffany Dufu had a reckoning on her first day back at work from maternity leave. After a hectic day running from meeting to meeting, she realized she had forgotten to stop and pump. And the reality of being a working mom hit her as the milk seeped through her blouse. Resentment and anger showed up that evening as she listened to her husband come home from work, and she thought through all of the things she had done to make his life easier and more predictable that day, from picking up the dry cleaning to putting a dinner plate in the refrigerator for him. It didn’t take long for Tiffany to realize that she had to renegotiate the terms of her marriage and redefine what it means to be a ‘good’ wife and mother. Tiffany took the time to get clear on what matters most to her and what she does really well, using that intelligence to decide which items on the to-do list were really necessary and which balls could be dropped. Today she explains the social conditioning that makes women think they have to do it all, what you can do in that moment of overwhelm, and how to determine your mission. I ask her how she initiated conversation about equity with her husband and why she has eliminated to-do lists from her life. Listen in for Tiffany’s insight around the urgency of having women in leadership and the value of investing in community. 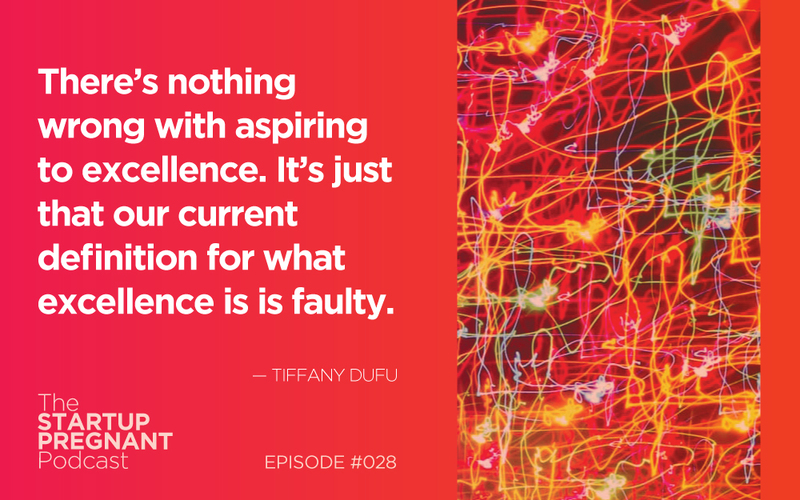 Tiffany Dufu is the author of Drop the Ball, a memoir and manifesto that seeks to help women cultivate the single skill they really need to thrive—the ability to let go. Tiffany was part of the launch team for Lean In and serves as Chief Leadership Office to Levo, one of the fastest growing millennial professional networks. She was named to Fast Company’s League of Extraordinary Women, and she serves on the board of Girls Who Code and Simmons College. If you’ve been wanting to donate to Planned Parenthood, the ACLU, or disaster relief you can use this app and it’s a piece of cake. Go to www.startuppregnant.com/charity to learn more about how HippoGive is currently matching all of your first-time donations up to the first $50!